Regulating Crop Genetic Resources: Why is Global Cooperation Failing? 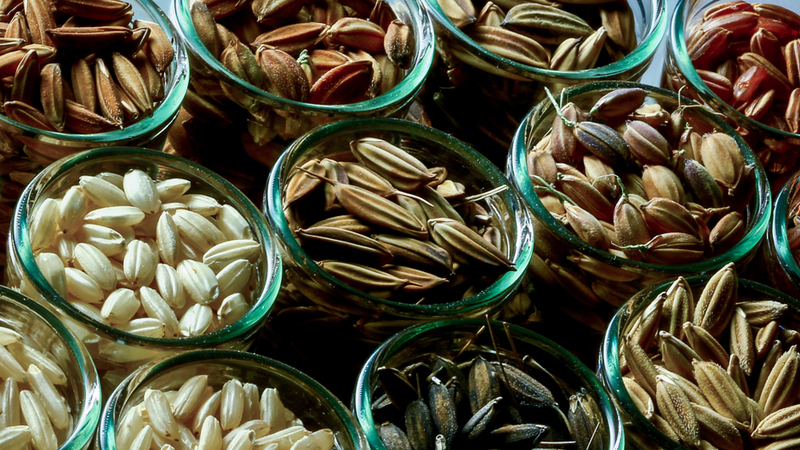 Rice seed variety. Photo: International Rice Research Institute. Creative Commons CC BY-NC-SA 2.0 (cropped). The real danger of relying on fewer agricultural species was vividly demonstrated as far back as 1845 when potato blight wiped out Ireland’s crop and caused widespread famine in the country. Over a thousand potato varieties existed in South America, but only two varieties were grown in Ireland. Yet today much of the world’s agriculture is intensive and axes on the genetic uniformity of crops. Ever increasingly, the selection or variation in crop plants is shrinking. This reduction in plant genetic resources will limit the evolutionary adjustment of agricultural systems to changing environmental and economic conditions. In the current age of population growth, this is an important topic, upon which I recently read a book by a group of agro-biodiversity experts that provides an extensive overview of international laws and governance regulating access to genetic resources and the sharing of benefits arising from their use. Crop Genetic Resources as a Global Commons: Challenges in International Law and Governance gives fresh insight into how and why plant genetic resources for food and agriculture (PGRFA) are pooled and conserved at farmer, community, research network and international levels, and how pooling practices are coordinated, regulated and affected by international organizations and country governments. The International Treaty on Plant Genetic Resources for Food and Agriculture (ITPGRFA), in concert with the Convention on Biological Diversity (CBD), aims to ensure the conservation and sustainable use of PGRFA so it may serve as the basis for global food security. Having entered into force in 2004, and comprising 131 contracting parties as of November 2013, the Treaty has implemented a multilateral system of access and benefit sharing for a list of 64 of the most important food and forage crops essential for food security and interdependence. A collection of 19 essays, the book touches on countries’ interdependence on plant genetic resources and the imperative of international cooperation, and reviews the history and design of the Treaty. It further offers critical reflections on the Treaty, how it could be different, and other ways of institutionalizing global genetic resources as a commons. Over the past 40 years, effective pooling practices have been hindered because of unequal stakeholder access to products from the PGRFA commons. Stressing the lack of coherence and inconsistent approach to the collection of PGRFA, the book makes clear that the system’s current rules of multilateral engagement undermine some actors’ incentives and obligations to actively participate in the stewardship of the PGRFA commons. Both in developed and developing countries, a group of stakeholders — including private industries, national governments, civil society organizations, local communities and universities — have directly or indirectly controlled the use of important products resulting from PGRFA commons. For example, through patenting systems, the private sector has restricted access to the use of innovation with great potential to benefit the PGRFA commons. Another example given is that there is a lack of willingness to stop free distribution of PGRFA products to non-member parties/countries by the Consultative Group on International Agricultural Research (CGIAR) and some European countries. This could discourage other countries that are yet to ratify the Treaty as some have access to pooled resources at no cost or without having to participate in the multilateral system. The book nonetheless spotlights the role of PGRFA in meeting growing food insecurity and global climate change impacts. A number of authors assess the potential benefits to PGRFA of applying conventional plant breeding and modern biotechnology techniques including transgenic tools to increase agricultural production and crop improvement. Although no emphasis was placed on controversial issues surrounding the use of transgenic technology, otherwise known as genetically modified organisms (GMOs), one chapter’s authors claim that GMOs and other modern biotechnology tools may ‘‘reduce the amount of diversity required in breeding programmes’’. The assertion is that questions will thus continue to arise as to whether GMOs benefit the conservation of plant genetic resources; hence there remains a need for further investigation in terms of its benefits and potential risks. A key component of a multilateral system as part of governance structures is that of a standard material transfer agreement (SMTA) — a contract between two parties that provides legal conditions for access and benefit sharing within multilateral system of PGRFA in the event that one of the parties commercializes a product. While one author argues that SMTA solves one of the major problems (the lack of capacity that affects developing countries in terms of access and benefit-sharing agreements), other authors disagree, pointing out that operations of SMTA can be very complex and laborious and thus invariably slow down the development of the multilateral system. The authors overwhelmingly agree that establishing collaborative networks and facilitated access to well characterized and improved PGRFA (such as drought tolerant traits) represent significant opportunities for many countries to respond to the future challenges of climate change. However, the book points out that some countries including the United States, China, Russia, Mexico and Japan are yet to ratify the Treaty. Though no specific reasons for such delay were detailed, it is likely that specific procedures regarding the Treaty may require screening and political debate at different levels of government before approval. The book argues that the participation of these five countries could motivate other countries to be full parties to the Treaty. But the authors note that the lack of an appropriate structure and transparent processes to make PGRFA accessible through a well coordinated multilateral system present a significant challenge. The book closes with a critical evaluation of the main principles of PGRFA and the current status of and difficulties in ratifying the Treaty and implementing the multilateral system. The section raises fundamental issues such as the use of intellectual property rights agreements between private industries and PGRFA providers (e.g., farmers), and provision of financial resources for capacity development programs through the Global Crop Diversity Trust. The authors address the poor integration of smallholder farmers into multilateral system, and engagement of private industries in the multilateral system, as well as harmonization of principles and objectives (conservation, sustainable use, the fair and equitable sharing of the benefits arising from the utilization of genetic resources) between the Convention on Biological Diversity (CBD) and the Food and Agricultural Organization (FAO) within the context of ITPGRFA. What seems to be lacking, though, is a thorough account of how to find ways, to develop complementarity and cooperation between the CBD and the FAO’s Global System for the Conservation and Sustainable Use of Plant Genetic Resources for Food and Sustainable Agriculture, as stated in the Resolution 3 of the Nairobi Conference for the Adoption of the Agreed Text of the CBD. A number of chapters discuss the scope of the multilateral system within the context of adoption of CBD as a binding international instrument and the negotiation of ITPGRFA on access and benefit-sharing. But perhaps a chapter should have been dedicated to thought-provoking reflections that could have been useful for opening an important and topical policy debate on the cooperation between the CBD and the FAO to increase financial resources and prioritize technological innovation, and how to reach a consensus for achieving conservation. Overall, this is an essential book, written for a wide readership, that captures the complex picture of governance, collection and access to PGRFA and begins another important debate on this pivotal topic. Regulating Crop Genetic Resources: Why is Global Cooperation Failing? by Ademola Adenle is licensed under a Creative Commons Attribution-NonCommercial-ShareAlike 4.0 International License. Ademola Adenle holds a PhD in Genetics and Molecular Toxicology from the University of Nottingham, UK, where he won the best student prize for his PhD research presentation at the British Toxicology Society’s Annual Congress in Surrey, UK. Ademola is a Japan Society for the Promotion of Science Fellow with the Science and Technology for Sustainable Societies team at the UNU Institute of Advanced Studies, and he is also a Visiting Scholar at the National Graduate Institute for Policy Studies. His current research focuses on the role of biotechnology in sustainable agriculture and climate change mitigation in developing countries.